large balconies/patios off each bedroom and huge ocean view deck , ocean view living room and bedroom, skylights, cheerful, bright, modern new furnishings, lounge chairs and umbrella off living room on ocean view deck, large attached 2 car garage, property has up to 3 parking spaces: 2 car garage, one carport parking, surround sound in living makes watching TV feel like your are in your own private theater, minutes from the pier; great food and fun in the sun, walk the famous sand of Manhattan Beach Strand, take home the sounds of the surf, look out at the horizon, your problems will quickly be lost in the sounds of the beach. Fresh fish on the pier, an unforgetable experience. I had high expectations and this house exceeded them. Beautiful property that had everything you could ask for, from great location, to well maintained everything, to thoroughly stocked with extra amenities. Joanne really knows how to provide the little extras to make the visit special. I would highly recommend staying here if you have the opportunity. 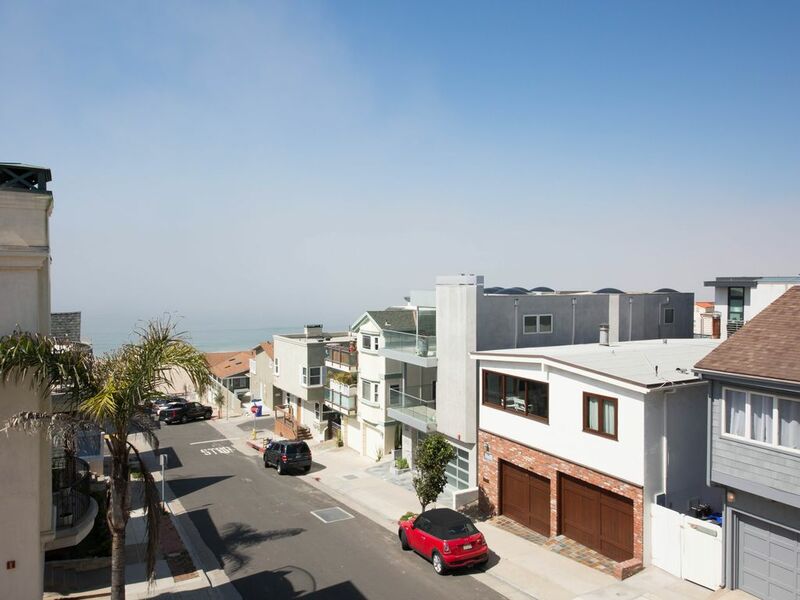 I cannot say enough wonderful things about this Manhattan Beach property! The location to the beach is perfect! The house is much larger than it appears in photos and it is very comfortable and very well stocked! Joanne is a lovely person and was a perfect hostess! The house was stocked better than any other home I have rented. She anticipated our every need or want! My family and I felt like VIPs in a five star resort! We cannot wait to return next year! Wonderful and beautiful family, great people. I highly recommend them to future hosts and look forward to their return in the future. My family just spent a wonderful get away at this wonderful property! The residence was nicely done, updated, and very clean. The owner, who is very friendly and helpful, made sure there were refreshments waiting for us and made every effort to ensure we had everything we needed. The location is perfect! It is a 10 minute walk into town (via the Strand by the beach which is lovely). We would highly recommend this property! Sheila and her husband were my perfect renters. They were wonderful guests, very clean, polite, quiet, and appreciative of my effort for a comfortable vacation. I will miss them. Whoever is fortunate to rent their property to them will also recognize these fantastic renters. They are my 5 star renters!!!!!!! Others wrote about the great location -- short steps to the beach and restaurants -- which I all agree. Another impressive thing was that the house was stocked with almost every supplies you need during the stay -- ample towels, beach chairs and towels, shampoo, soaps, tooth pastes, dish and laundry detergents. Kitchen amenities was also ample. Thanks Joanne and Ernesto to help make our stay so enjoyable! A wonderful renter, lovely family, clean, and they are welcome back anytime. Joanne thank you thank you!!!!! I cannot speak highly enough of our stay at this beautiful home! Our family booked this home for a much needed family vacation and we are so happy we did!! I knew this would be a great vacation before we even went, I had heard from the owner Joanne in a couple of emails stressing how she and her property manager were there to make sure our vacation was enjoyable. The house is a short block & 1/2 from the Strand which made many early morning and evening walks along the beach a cinch. It was also easy to carry beach items the short walk. Beach chairs and towels were provided! The house is exactly as pictured, very well maintained, lovely décor, 3 bedrooms all with ensuites which worked perfectly for us and our 2 adult children as we all had our own space. And would be perfect for 3 couples sharing the home. The balcony off the main living area has a direct view of the ocean and views of the gorgeous sunsets every night! We spent a lot of great family time sitting out there with our meals at the outdoor table or just sunbathing on the lounge chairs. We have rented homes before and this is the first one that has been so well stocked. The kitchen has everything you could need to make any meals as well as blenders for smoothies which made my daughter very happy! The bedrooms had extra blankets, pillows etc and the bathrooms had plenty of towels so you weren't drying with tiny towels or having to do laundry every day. Joanne even went above and beyond by providing some toiletries in case you needed. I have never seen this in any of the other homes we rented! We happen to arrive while the property manager was present and he was very nice and offered to show us around and ensured us he was only a phone call away if needed. We spoke with Joanne during our stay and she is an absolute sweetheart! I highly recommend this home and cannot wait to make this our go to vacation spot! Thanks again Joanne for sharing your beautiful home and helping us have a wonderful family vacation!! Joseph and his family were perfect guests: clean, quiet, friendly and a wonderful family. It would be my pleasure to host them again. One when I vacation in New York, I intend to see them there in the future. We stayed here for our son's law school graduation. It was an excellent choice! Waking up every day to hearing the ocean (especially when you are from PA) to the very short walk to the beach- everything was perfect. The home was spotless, comfortable and perfect. If you need a place to stay in Manhattan Beach- this one is it! Thanks Joanne for a wonderful place- we will be back!!! Best guests ever!! Clean, friendly, appreciative, quiet. polite. Could you ask for more? surfing, cycling, jogging on the beach path,walking, beach volleyball, great people watching, Jacuzzi tub inside master, fantastic ocean views, beautiful whitewater ocean view deck with outdoor BBQ, table/chairs for outdoor eating, 5 houses to beachfront Strand.